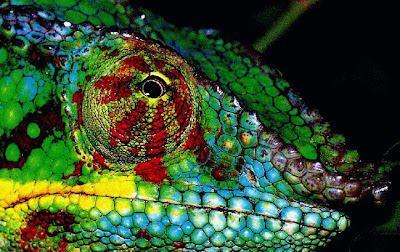 Chameleons, it's reported, can fine-tune their colour changes to hide according the visual systems of specific predators. In the presence of a snake, it seems, they don't have to try as hard as they do with birds, which have better vision. The findings are published not too long after work indicating that chameleons first evolved the capacity to change colours in order to attract the attention of other chameleons. leaving, of our culture, an ectoplasm of ink.